Not a real falling egg, but kind of a "trompe l'oeuil". 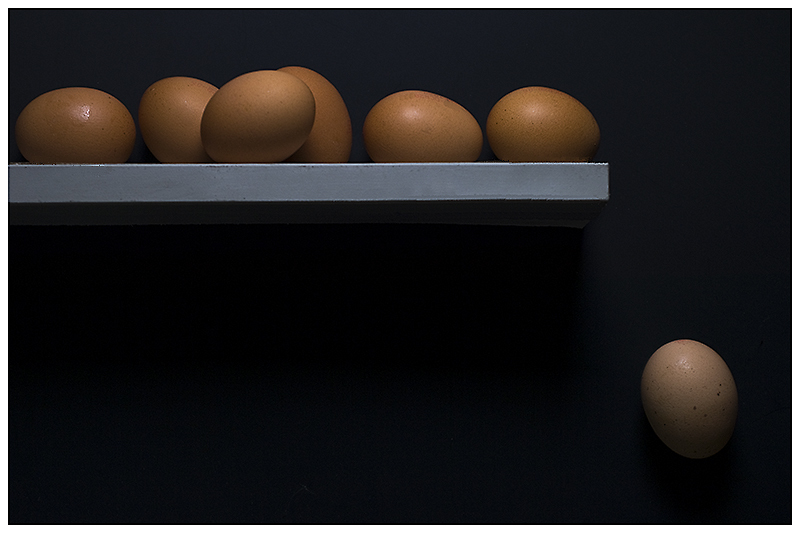 The eggs are laying down on the floor, board standing up underneath them. I had no shelf on the wall to do this and my son brought the idea on to try and pull it of this way. I had to keep the light very low so that not too much shadow appeared under the "falling" egg, which would give away immediately that the egg was not falling. Therefore I predict a sub 5 score for this entry. I feared I was living a fantasy. Since vote 8 this entry kept hovering between 6,32 and 6,40 and it topped at vote 12 with 6,5833. I didn't dare to hope that this would continue until the end. But it did and with this I've beaten my PB twice in a row. Congrats on a splendid new personal best on a wonderfully creative setup! Good job with the light! Congrats on TT Nadine, and your new PB. This was my favourite image in this challenge, and, like Oliver, I didn't guess it was tricky either. Very well done, hadn't guessed it was a trick shot. Congrats on a new PB! Message edited by author 2013-06-25 03:58:54. Really nice still life, beautifully lit and arranged. I'm bumping this up for the second time. Now you have a 10. Proudly hosted by Sargasso Networks. Current Server Time: 04/22/2019 12:41:04 AM EDT.